Figure 1. Experimental timeline (not drawn to scale). Mice are acclimated to the mouse facility for at least 8 days following their arrival. Exercise and metabolism data collected as part of a highthroughput phenotyping screen. a. Body weight (BW) is measured before and at the end of wheel running activity (Fig. 1). b. Likewise, body composition is evaluated for fat and lean mass percentages before the start of wheel running and again afterwards using magnetic resonance imaging (MRI). c. For easier spill detection and collection, standard laboratory chow is ground, dyed blue, and presented in spill-resistant feeders. Any spillage is collected and weighed. d. Daily average food intake is calculated for 3 days prior to wheel running activity by dividing the total amount of food consumed over the 3-day period. 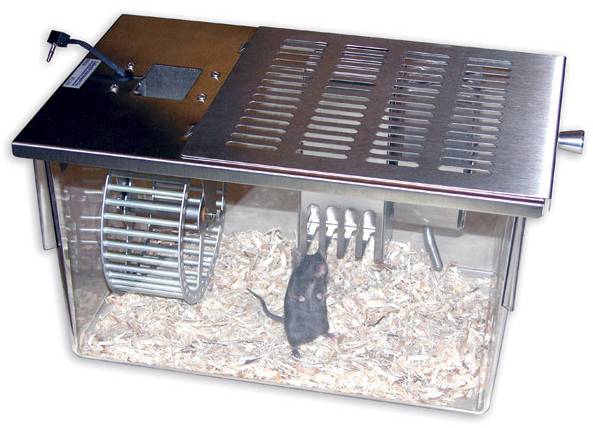 e. The day before mice are given access to running wheels they are placed into calorimetric chambers and O2 consumption, CO2 production and respiratory exchange ratios (RER) are measured for 24 h.
f. Wheel running is recorded continuously over a 12-day period using an automated activity wheel monitoring system. g. During the 12 days of wheel running, food intake is measured every other day, and daily averages are calculated. h. Change in BW and percent body fat in response to exercise are calculated by subtracting the pre-exercise value from the post-exercise value. Negative values indicate a loss of BW or fat in response to wheel running. i. Food intakes are corrected for body weight by dividing average intakes by the average BW for the measurement period. j. Distance and speed data are directly extracted for day 1, and running distances and speeds are averaged for days 5 and 6 and days 11 and 12 of wheel running activities. Collaborative Cross (CC): is an emerging mouse recombinant inbred (RI) panel that was designed to extend the available mouse genetic reference populations (Philip et al. 2012) by combining the genomes of eight genetically and phenotypically diverse strains through randomized breeding design that systematically outcrosses eight founder strains, followed by inbreeding to obtain new recombinant inbred strains. Respiratory exchange ratio (RER): ratio between the amount of O2 inhaled and CO2 exhaled in one breath, an indirect measurement of energy expenditure.